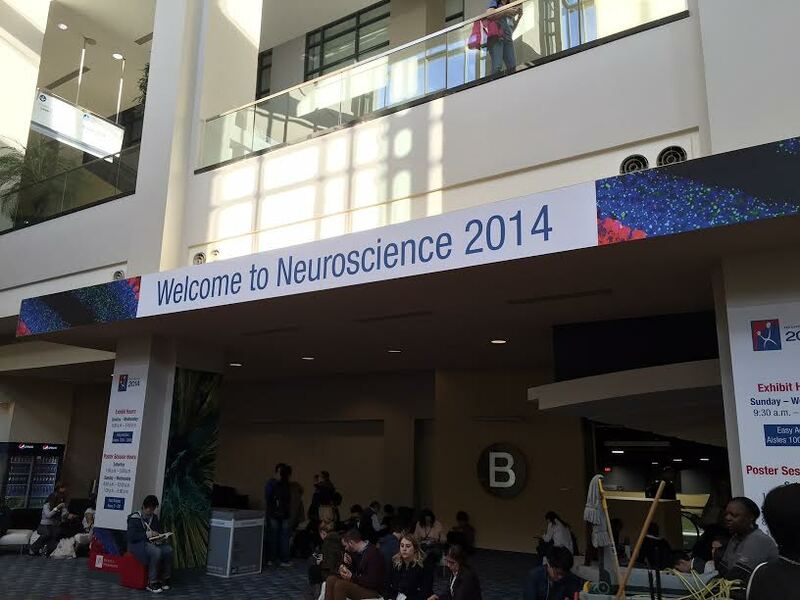 The first day of SfN2014 is only a half day. But already there are over 29,000 people registered! So if you are looking for your friendly neighborhood neuroscientist… he/she is probably here in DC. 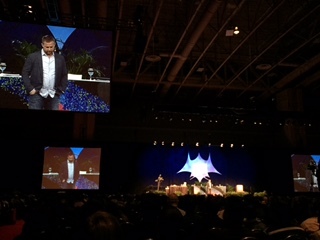 Executive Chef and owner of 6 restaurants, Top Chef TV show Master Bryan Voltaggio kicked off the Annual SfN meeting today with a really interesting talk about food: “Food for thought: Tastes, Aromas, and Memories of Food”. SfN president Carol Ann Mason introduced this talk bringing in the importance of a non-scientific perspective on neuroscience. And it is important. All of our academic and industry work is based on real world questions, scenarios and activities. So while we may think we are experts in the science behind behaviors, like feeding and sensory processing, Chef’s like Voltaggio can share a unique perspective on how very scientific principles apply in the real world: EXPERIENCE. As a chef, Voltaggio’s goal is to “create memorable experiences”. So in preparing for his talk he asked himself “what can I offer a group of scientists?” Voltaggio discussed his process in creating an experiential meal, not just by talking about it, but also through deomonstration, cooking a meal live on stage and feeding a panel of academic neuroscientists. So how does he create an experience? Voltaggio explained that the food must hit all of the senses. 1st: experience – The atmosphere is set when the patron walks in the door so that the expectations are laid out: fine dining versus “fast casual” (this is apparently the new term for ‘fast food’). Fast Casual is typically hard/harsh, designed to get the patron in and out quickly. Fine Dining on the other hand is soft/luxurious, encouraging the patron to stay, relax and enjoy. This can be established through sights, sounds, textures, etc. And more recently by social media. Most people these days have already seen the setting and food via pictures on Yelp, and so expectation are already set. 2nd: ingredients – “Freshness”, etc. The fresh food should taste good and typically this is something that can be seen. Fresh local foods can be very important. 3rd: play on senses – It’s all about presentation, the sizzling dish walking by, the open kitchen with the sounds of the grill, the aromas, the plating of the meal… it all “feeds” into your experience. He notes that it is important to not use real flowers on a table as this can take away from the aroma creation. So how does he convert ingredients into experiences? By taking ingredients and giving them a new feel, like crispiness, or feeling like luxuriousness. And then layering the flavors and ingredients to make a play on the senses, crispy with soft, sour with sweet. For his live cooking demo, he hoped to portray what he’s learned as a chef. The meals looked amazing, especially since it was lunch time and I was very hungry. The food had a very “molecular gastronomy” spin to it starting off with a “mock oyster” that he designed using chemistry to recreate eating an oyster using non-oyster ingredients. He also did this for a “deconstructed bagel & lox”, a congee/mushroom dish representing “fall foraging”, and an all white frozen dessert meant to represent “winter”. The theme was “sensory illusion” and “putting memory on a plate”. 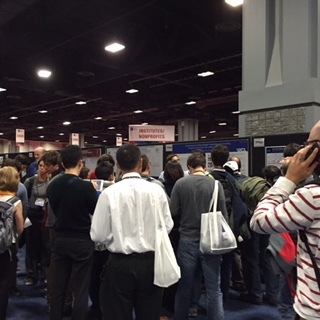 This “nano”symposium was packed. All of the seats were filled, scientists were seated on the floor along the walls and down the aisles, and it was standing room only in the back. People were clearing into paying attention. The work all appeared to be fMRI based with focus being on facial recognition, categorization, and spacial/object selection. I won’t go into all of the details of the studies. But I did tweet out to Leo DiCapprio and Matt Damon that their faces were used as “recognizable” stimuli and compared to other hotties like Benedict Cumberbatch, Brad Pitt and George Clooney. This is your brain on hot actors. A big take away I had for this part, given my industry/application spin, is really more based on how fMRI is being used to measure consumer reactions to advertisements. It’s clear that different people and places can affect neural patterns seen via recognition. This may be important for those studying advertisements that use spokespeople and busy mixed scenes. 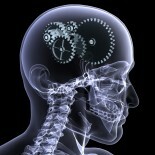 Our brains have a bias that can involve recognition, memory, and spatial attributes in the stimuli. Take note neuromarketers! Emotions/Perceptions – First off, I want to thank all presenters that include copies of their posters to share. This really helps when there are literally 1000s of posters at this meeting. Balancing a notepad to jot down important information causes hand cramping. So your service is greatly appreciated. There was a great number of posters on the interaction of mood and music and how one can affect the other. But one study that stood out to me, probably mostly because the presenter was so friendly and informative and helpful was an EEG study on “Perceptual task difficulty and inhibitory control of go-nogo task: an ERP study”. The idea was to challenge people with a continuous performance task with normal and degraded cues. When the decision was more difficult (due to a degraded, difficult to discern cue) N2 was affected indicating that this is a “conflict resolution” marker. This has great impact on the interpretation of EEG & ERP when subjects are making rapid decisions. Dr. Shucard gave the example of if you were measuring the ERPs of a cop having to make a decision to shoot or not when approached by a person with their hand coming out of their pocket. Dramatic stuff! But maybe even has implications for more mundane tasks as well. Today was a good day. I’ve definitely already walked several miles just around the conference. This entry was posted on November 15, 2014 by nerdoscientist and tagged neuroscience, SfN.